With a change to normal routine, festive food and many opportunities for sensory overload, I know many families with disabled or additional needs children can find the period a struggle. But for me, unlike other holidays, Christmas means lots of other adults around to help take on ‘Pudding duty’. Just before Christmas we had a lovely holiday with my extended family in Center Parcs. We didn’t book any particular activities for Pudding – the only one he would have liked would have been football. The sessions for his age-group were a bit beyond him, and if we’d booked him on the younger session his hard accurate kicks could knock the tiny two year olds down like skittles. He had not been in a swimming pool for 18 months and it wasn’t a huge success then, so I was a bit unsure what he’d be like this time. He loved it! Straight into the water and happily throwing his ball to anyone nearby. And the other thing he loved was our family photo session where we played to the camera beautifully. Christmas itself was much quieter. Was he excited about presents? Well, not so much. Breakfast was far more important in his book. But he definitely enjoyed playing with new toys once they were open. And he gave the rest of us a great Christmas present too – an afternoon nap, which is happening less and less these days. This meant we all had time to play Twiglet’s new board game, impossible when a little whirlwind is around to grab pieces and knock the board over. So now is traditionally time to look onwards to the next year and wonder what it will bring. Politics aside, I find I can welcome 2017 in with a bright heart. Yes, it will bring down days and medical stuff, including another general anesthetic in less than two weeks. But it will also bring more progress (we hope) in Pudding’s skills, more new friends, more laughter, more love and light. Here’s wishing you all oodles of the good stuff in 2017 and the strength to deal with any of the bad stuff that comes your way. As I said last year, I’ve always loved Christmas. I know it’s not for everyone. And there are some people out there who prefer the wild partying and heady celebrations of New Year. But for me, Christmas is family and warmth and lights on the tree and food and… Oh, loads of other things that make this time of year special. This year seems just a little bit more exciting to me and the reason is, of course, partly due to my Pudding. In the run-up to the festive season I’ve had a number of people ask the usual question. ‘Is he looking forward to Christmas?’ The answer is still that he hasn’t any idea what is happening tomorrow, let alone a week or month ahead. He can’t write his own Christmas cards, or sing any carols, or tell us what he wants from Santa. He won’t ask ‘Is it nearly Christmas yet?’ or get excited about putting his stocking out on Christmas Eve. But this year there are a few little differences. Since he was a toddler we’ve always put the Christmas tree up in our bedroom, out of reach on a chest of drawers. Sparkly things can be enticing for impulsive fingers. 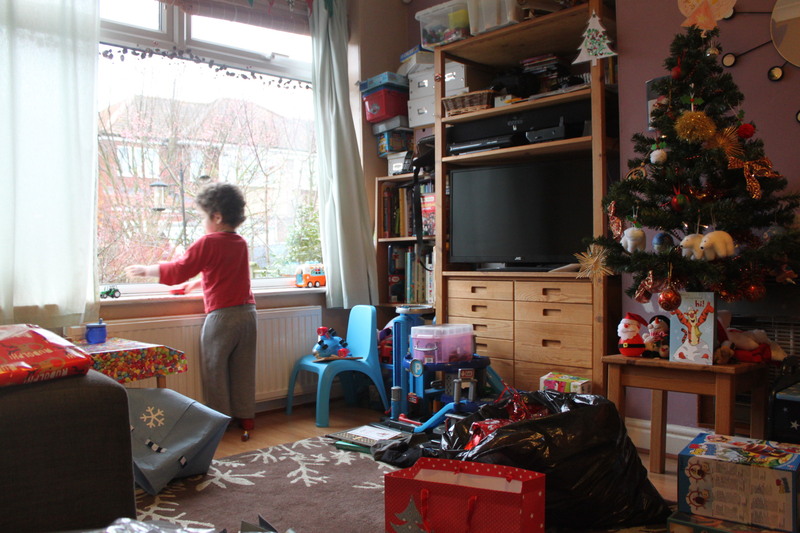 But this year he does seem a bit more sensible so it’s downstairs. On the first day he did hit one of the baubles repeatedly but has pretty much left it alone since. There is still the possibility that his giant Olaf toy could be used as a baseball bat on it, but hey, sometimes it’s good to live dangerously. The big man in red is still a bit of a mystery to him but given his sociability, Pudding is always happy to meet anyone. 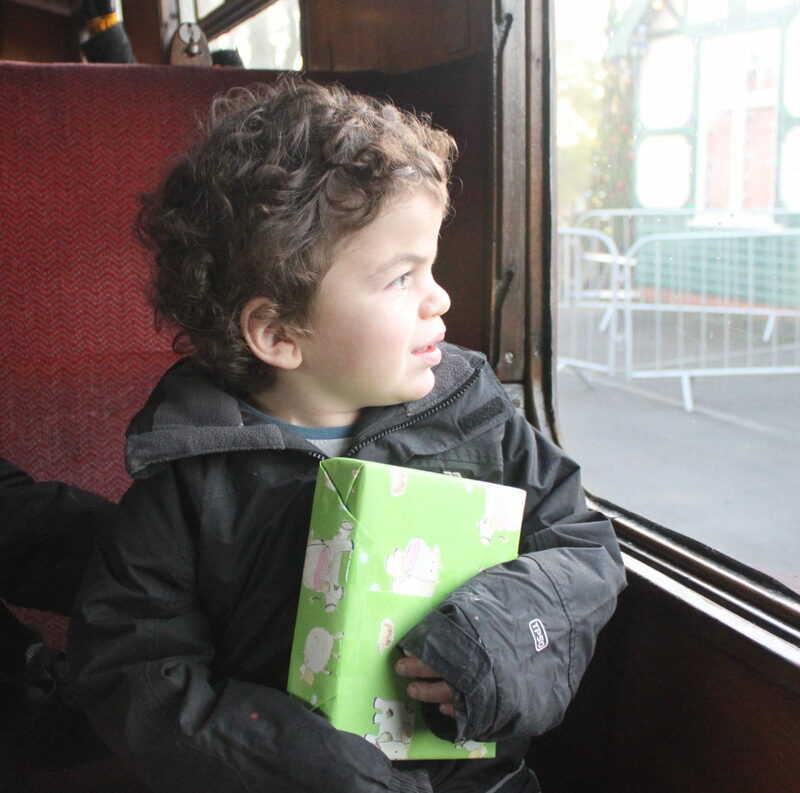 Last weekend we took a train trip to see Santa. Pudding was the first child to to receive his present and was really chuffed with it. He held it, showed it to everyone on the train, put it in the bag, took it out again, showed it to everyone again… He didn’t seem to have much interest in opening it, but I think we can safely say that this year he’ll like receiving presents! He may not be terribly keen on our lovely vegetarian Christmas dinner (he would definitely prefer the meat option), but I look forward to his enthusiastic signing of ‘cake’ repeated over and over again. And I know he’ll be happy with the relaxation of rules about no chocolate at breakfast time. Of course the biggest change has been on the medical front. Last year, Pudding had just had a bad reaction to his second home infusion and we were facing the prospect of going back into hospital for the next one. We were also waiting to hear whether he would get onto the clinical trial to stop progression of the condition in his brain. One year on, and he’s had no reactions to ERT since. He also seems to be doing well on the trial as far as we can tell, and we do have hope for the future. I’m writing this early in the morning as I wait for everyone to wake up for a fun-packed day with our extended family. Pudding will run around with a ball and cause chaos, revelling in all the attention of grandparents, aunts, uncles and cousins. Despite some emotional posts lately, life is good. I’m unlikely to receive the best Christmas present ever – a cure for Hunter Syndrome – but in the meantime, a cheeky grin and vigorous cuddles will do me. Christmas Pudding, anyone? Ah, the school nativity play. That time where parents struggle politely for the best vantage point to watch their sweet child parade onto the stage with all the others. The tinsel, and cobbled together costumes. The angel so busy looking out for her parents that she carries on walking and nearly trips over a shepherd. The child who says their words so quietly that no-one can hear. Another who shouts down the microphone making everyone jump. Teachers scurrying around organising everything yet trying to stay unobtrusive as this is the chance for the children to shine. It’s guaranteed to set off the happy tears in all but the grumpiest of Scrooges. I so wanted this to be a positive post. I was looking forward to the nativity and watching Pudding join in with his peers in his own fashion. I pictured him smiling and waving, going in the wrong direction and making us laugh. He had been cast as one of the stars and we’d agreed beforehand that his special chair would be brought in to the hall. This meant that he could be strapped in safely when waiting rather than having the danger of falling off the stage. I knew this would make it very obvious how different he is from the others but decided it was for the best. His difference was highlighted even more when he wouldn’t allow his star costume anywhere near him, so was the only one in school uniform. It was clear from the off that he wasn’t happy. Bribery with food worked for a while as it usually does. He did enjoy ringing bells at the end, and joined in the dancing very briefly. But as I watched him pulling another star’s costume and hitting the TA behind him, I was crying and it wasn’t the happy tears. I don’t like being hit by him myself and I love him. While I sat up there in the audience powerless to do anything about it I felt worse and worse. How long would others put up with that treatment before they say ‘enough is enough’ and ask politely whether this is the right place for him? Having a child with additional needs is full of ups and downs of course. And those moments when it is hit home to you quite how different they are from other children their age are definitely responsible for many of the down times. Thank heavens for others who understand. Later I bumped into someone else who has a child on the school’s SEN register. I told her that I had cried at the nativity and not in a good way, and she instantly knew what I meant. Though our children’s diagnoses are not the same, we share many aspects of experiencing difference in a ‘normal’ world. It was definitely a silver lining in that cloudy day and helped me put things back in perspective. Pudding’s TA told me the next week that it hadn’t worked out as well for him as the team had planned and how bad they had all felt. But I didn’t blame them at all. They’ve done a fantastic job at making him included – including using Makaton during the performance to wish everyone a Happy Christmas. If anyone I blame myself. He had been off school the previous two days because of a cold, but I thought he was ok that morning. Now of course I have to ask myself whether I really thought that, or whether it was just because I wanted him to be. If he’d been feeling more himself he’d probably have revelled at the chance to perform and show off to an audience, but as it was he just didn’t want to be there. When Pudding first started school I insisted that I wasn’t sacrificing him on the altar of inclusivity. If mainstream wasn’t right for him then we’d look at other options. What I need to remember is that this applies to the little things too. Inclusion isn’t always the right thing. Not if it makes him unhappy. I have my own hopes and dreams for him, but ultimately I want him to be happy. And if he is, then I will be too. Having written about emotions last time, I’ve come to realise something (probably fairly obvious) this week. I am so much better at coping with everything when I am well rested. I’ve had a few late nights recently, and I find it leaves me in such a fragile state of mind. When I’ve slept enough, I can keep things in perspective, write a reasoned blog post and get on with life. When I haven’t, I spend the day with a cloud of impending doom hovering over me and dissolve into tears at the slightest thing. And that can be hard to explain to outsiders. If they notice that I’m not being myself and ask what’s up, I have a choice. I can burst into tears and blurt out and say it’s nothing specific, ‘just everything’. Or I can blame the redness of my eyes on contact lenses that I’ve just put in, and to be honest that’s probably the easiest. Recently I heard someone mention sleep deprivation after a few late nights. I didn’t comment! I used to be a ten-hour-a-night girl. I lived in Sister’s house until Niece was a year old, but I would put ear plugs in and sleep undisturbed. When I got together with Hubby he could get up in the morning for his walk to work and I would roll over and sleep longer. If I had a late night, I’d be tired but knew I’d catch up with sleep the next night. I never questioned that luxury. Then I had my own children. Everyone knows the theory – babies wake up all the time, but you get used to it, and eventually, sooner or later, they sleep through. And the sleep deprivation eases. I bought into that illusion. And yes, it did work with Twiglet. 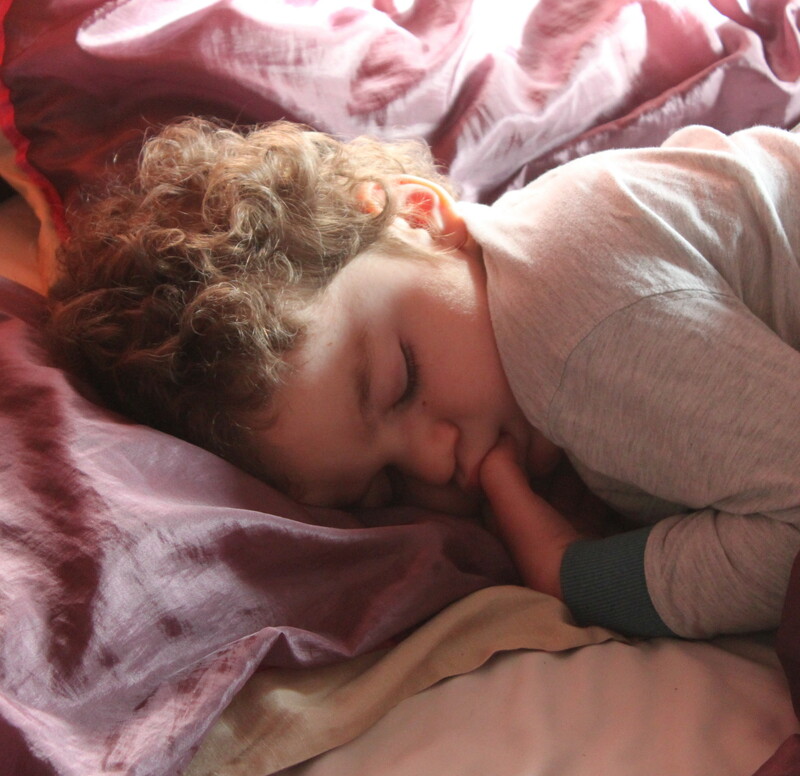 When he moved to a big boy’s bed (aged two and a half) we did have a few broken nights, but on the whole he sleeps like a log. Part of the problem I know is that since becoming a mother I think I simply don’t sleep as well as I used to. There is a small area of the brain that just stays on alert the whole time, listening out for the slightest sound, the slightest hint that your child needs you. And boy, does it get a work-out with Pudding! Since he was a very young baby, he just hasn’t slept as well as ‘normal’ children. (Something I now know is common in MPS as well as other conditions such as autism) Every night he will wake up, perhaps at 9pm, perhaps at 2am, and have what I can only describe as a party in his cot. He’ll laugh and kick the bars and shout ‘You!’ at the top of his voice. He always sounds happy and goodness knows how he can have so much fun in the dark by himself, but I’m grateful for that at least. Melatonin has helped. His wake-ups don’t last quite as long now – often more like half an hour rather than two hours. But in different surroundings, such as the hotel room in Manchester or the hospital ward, it can be difficult to persuade him back to bed once he’s awake and decides it’s time to play. At home he has always been contained in his cot but this can’t continue for ever. With his size and slightly increased flexibility (a benefit from his weekly treatments) there is now the very real possibility that he could climb/fall out. So we need to move him to a bed. We’re currently in the process of clearing out the office so he can have his own room, as Twiglet probably wouldn’t be appreciate being jumped on in the night. I’ve no idea what is going to happen. Will he stay in bed? Will he spend all night banging on the door to get out? Wish us luck! And expect some more emotional sleep-fuddled posts from me in the near future….